PlumWater Cottage: It's a Cloche Party! Today is the Cloche Party at A Stroll Thru Life. I've always loved the look of cloches covering tender plants in the garden early in the season. Other than cold frames, I think my first memory of seeing a cloched plant or start was early in the years of Country Living magazine when they had an article on starting roses from cuttings....there was a little row of rose cuttings covered by upturned Mason jars--a simple, beautiful garden vignette. I've searched through my magazine clippings, but couldn't locate the picture, but it will always remain in my memory. 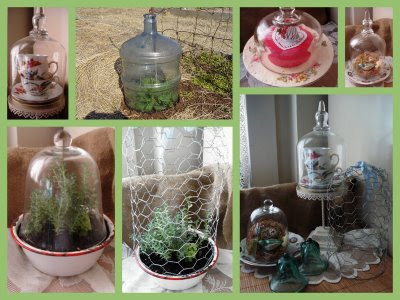 I've used cloches to cover seedlings, but for the most part I use them purely for decorating, whether it's a crepe paper "cake", or tea cups, cloches add a touch of beauty. All pictures above are mine, except the second from the left on top...it's a Google image of a large plastic jug with the bottom cut out and placed over plants in early spring...great idea! Beautiful cloche collection. Love the one with the plants. They are all so pretty. Your header picture is so pretty - I love hydrangeas. Lovely display of cloches! And do you have a few! I need to buy more! heehee! That is such a great and frugal idea for using the plastic water jugs as a cloche in the garden! I had about 8 or so I got rid of when we moved and that would have been perfect to use this spring!! Now I have to go a hunting again for some more! Love your mosaic with all the cloche ideas. And I love your blog header photo. Fabulous!!! The cloche on the old metal bowl is a great idea! I love that look. Happy cloche party! Oh, what new eye candy! I see something new on every one. How exciting! Love the wire cloche. I have seen one before and had forgotten about it. THanks for the reminder and thanks for sharing! These are all absolutely wonderful! I like your mosaic...your cloches are lovely!